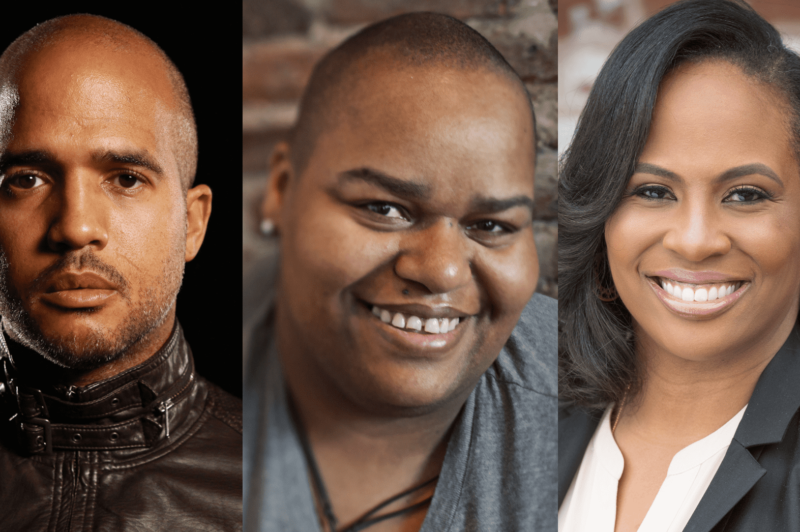 Join composers Toshi Reagon and Daniel Bernard Roumain, Apollo Theater executive producer Kamilah Forbes and vocalist and Helga podcast host Helga Davis for a conversation about the contributions of black artists to contemporary opera and the narratives they are driving in American culture. The evening includes performances from new works, including Reagon’s “Octavia E. Butler’s Parable of the Sower,” an operatic adaption of the science fiction novel, and Roumain’s “We Shall Not Be Moved,” an interdisciplinary opera co-commissioned and co-produced by Harlem’s Apollo Theater, Opera Philadelphia and London’s Hackney Empire, which will have its New York premiere on Friday, October 6 at The Apollo. Can’t make it in person? Watch our live video stream. Toshi Reagon is a talented and versatile singer, composer, musician, curator and producer with a profound ear for sonic Americana—from folk to funk, from blues to rock. She is the librettist, composer and music director for “Octavia E. Butler’s Parable of the Sower,” an opera she wrote with her mother, singer/song leader and activist Bernice Johnson Reagon. Daniel Bernard Roumain is an acclaimed composer and performer, whose career spans more than two decades. Known for his signature violin sounds infused with a myriad of electronic and urban music influences, Roumain takes his genre-bending music beyond the proscenium. He is the composer of the opera “We Shall Not Be Moved,” which tells the story of five North Philadelphia teens who find refuge in an abandoned, condemned house, where a 1985 standoff with police infamously ended with a neighborhood destroyed and 11 people dead. Kamilah Forbes is the executive producer at the historic Apollo Theater as well as an award-winning director/producer for television and theater. She has directed on Broadway, Off-Broadway and regionally with credits that include: Arena Stage “The Blood Quilt” and Baltimore Center Stage: Detroit ’67. She was also the associate director of the Broadway production, Raisin in the Sun (2014), and is the recipient of an NAACP image Award. Forbes is a co-founder of the urban arts non-profit Hi-Arts.